India is a land of kings and maharajahs. If you start digging out the country's history, you'll discover interesting sagas of the past. Rajasthan is one place which is deeply rooted in history, truly worth exploring. The state is redolent with the tales of valour and bravery. Rajput kings were known for their lavish lifestyles and extraordinary prowess. Maharana Pratap Singh, Jai Singh, Man Singh and Prithviraj Chauhan are some of the most famous Rajput kings. The exquisite forts and palaces built by these maharajahs stand tall today all across the state of Rajasthan to tell the stories of the past and showcase the royalty of the maharajahs. 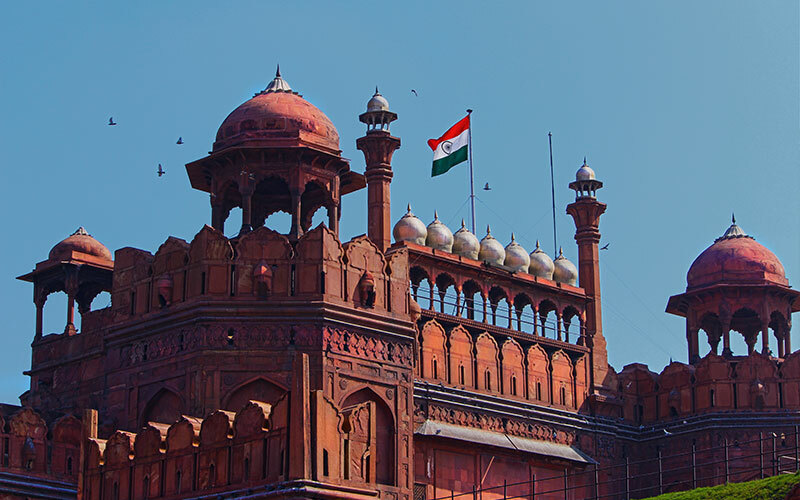 After your arrival in Delhi, go for a guided sightseeing tour of the city. Head towards Agra, which is home to the world-renowned Taj Mahal. Immerse yourself in the heavenly beauty of the world's most impressive building. Next, get ready to explore the royal city of Jaipur, the capital city of Rjasthan. Drive to Pushkar to check out the venue of the world's largest cattle fair and see the Lord Brahma Temple. After enjoying an adventurous jungle safari into the deep confines of Ranthambore, visit the historical town of Kota. Spend some time at Bundi, another place of historical importance, before stepping on the soil of Chittorgarh which is famous for the Chittorgarh Fort. A sightseeing tour of Udaipur, one of the most romantic cities of India, is something you will fall in love with. 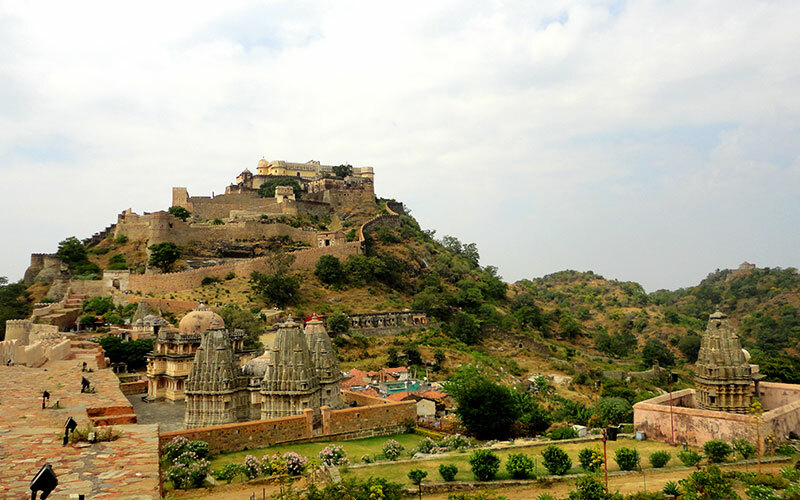 Also, see the much popular Jain Temples located in the lap of the Aravalli Hills and the Kumbhalgarh Fort. 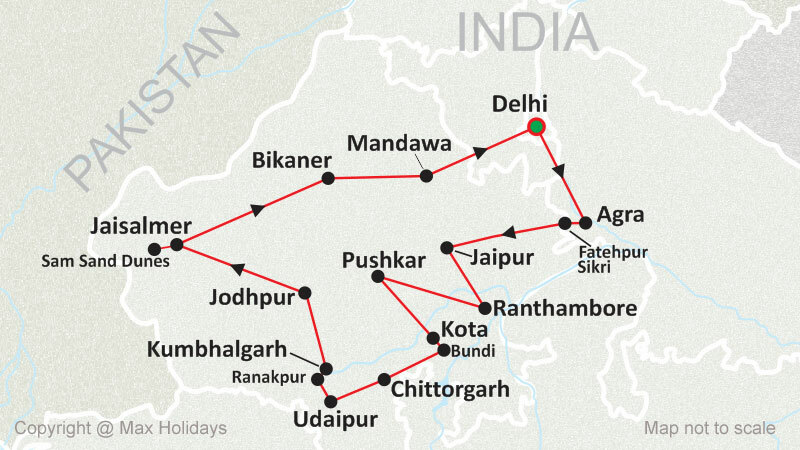 Later, undertake a tour of the three desert cities – Jodhpur, Jaisalmer and Bikaner. Together known as the 'Desert Trio', each of these cities is known for their unique attractions. Enjoy a full day of wonderful sightseeing, one city at a time. After visiting Mandawa, well-known for havelis and frescoes, get back to Delhi for your onward journey or connecting flight. Upon arrival at Delhi International airport, you will be welcomed by the representative of Max Holidays with garland, after that you will be transferred to your designated hotel. Check in hotel, you are free to spend rest of the time with comfort at hotel. Evening is free to explore the nearby area. Overnight stay is at respective accommodation. After breakfast at hotel, proceed for a full day sightseeing tour of Delhi – it is not only a political centre but it is a cultural heritage site, where people from different caste and culture are settled and enjoying their lives peacefully. Delhi is divided into two parts- Old Delhi and New Delhi. Start your tour by covering Old Delhi visit – Raj Ghat, Jama Masjid, Red Fort followed by a rickshaw ride at moon square – one of the oldest and crowded market in India. After completing Old Delhi, you will be taken for New Delhi by visiting Humayun’s Tomb and Qutub Minar. Delhi tour also include drive past through the diplomatic lanes of India Gate, Parliament House and the President’s Residence. Spend your night with sweet memories of the tour at Hotel in Delhi. After lavish breakfast, leave Delhi and head towards Agra – today Agra city is known for its outstanding and extraordinary, world famous building i.e. Taj Mahal. Agra is often called as city of Taj. Reach Agra and check into your designated hotel. After freshen up, get ready to visit the awesome and magnificent - Taj. Enjoy the visit to the world’s most impressive building Taj Mahal also known as the “Monument of Love” and recently declared as the one of the seven wonder of the world. 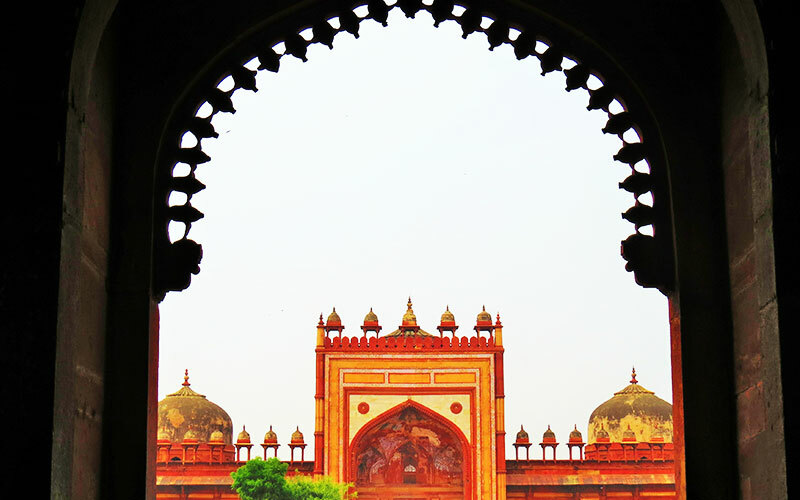 Later enjoy visit to Agra fort – famous for its architectural view, it has got the Aga Khan Architecture award. Musamman Burj in Agra fort is the place in the fort where Shah Jahan spent last seven years of his life when he got imprisoned by his son Aurangzeb. Overnight stay is in the city of world heritage sites and history- Agra. After having your breakfast at hotel, drive to the Pink City – Jaipur also famous as city of colours, culture and hospitality. On the way to Jaipur, enroute visit Fatehpur Sikri also known as the “Ghost Town” – once the capital city of Akbar built uniquely and attractively with the red sandstone. On arrival in Jaipur, get transferred to the hotel. Evening is free for leisure or you may have an option to make your evening wonderful by shopping in the local market. You may also have an optional excursion tour for Chokhi Dhani based on village theme, there enjoy Rajasthani Folk dance show with local cuisine. Overnight stay will be at Jaipur. Have a hearty breakfast at hotel and then proceed for an excursion tour of Amber Fort (Hill fort). Enjoy the royal elephant ride to reach the fort and get the feeling of being really in the city of ‘Maharajas’. The architecture of the fort is the complete mixture of Hindu and Muslim style which give the fort a panoramic view. After that, have your lunch at the city restaurant and then proceed for the local sightseeing of Jaipur city. Start with the City Palace; it houses the Chandra Mahal, Shri Govind Dev Temple and the City Palace Museum, one of the most visited attractions in Jaipur. Followed by visit to Jantar Mantar – one of the largest best preserved observatory built by Raja Jai II (a genius astrologer who could speak 16 different languages) and consisting of outsized astronomical instruments which are still operational and last is Hawa Mahal also known as the “Palace of wind” is now the land mark of Jaipur. The palace has 953 niches and windows. Evening is free for shopping. While doing shopping you can go to jewellers shop and you can also see the cutting of gems and polishing. Overnight stay will be at Jaipur. Morning we head towards Pushkar – one of the sacred places for those people who follow the Hindu religion. By noon, you will reach Pushkar and then transfer to the hotel. Later enjoy sightseeing tour of Pushkar. Pushkar is well known for their Kumbh Mela in the world and it is the only place where Lord Brahma temple is situated. Pushkar is famous for being the venue of one of the largest cattle fair in the country, where people from all around the country come to sell and buy cattles of different breed. Also visit the mausoleum, Ana Sagar and Akbar's Palace. Spend your night at Pushkar. Have a hearty breakfast at hotel and then start drive to Ranthambhore. Ranthambhore is the best destination for adventure tour and has splendid natural views to enjoy and explore the place. Rich in flora and fauna, Ranthambhore is the must visit destination while you are on Rajasthan tour. Reach Ranthambhore and check into your pre-booked resort. Later on proceed for the afternoon safari to spot tigers. Overnight will be at Ranthambhore. Enjoy morning and evening game safari of Ranthambhore tiger reserve. Ranthambhore tiger reserve is extended over an area of 392 sq. kms of thick forests. It is the place which holds a great natural and scenic surrounding; it is the home place for all sort of big and small animals, reptiles and birds. It is the best place for jungle safari and to watch animals and birds like Tigers, Leopards, Hyena, Jackal, Sloth Bear and Wild Boar. If your luck works you can have a view of all these including spotted Deer, Samba Deer, and Nilgai (blue bull) Antelope, Chinkara (Indian gazelle) and the common Langur. Overnight stay is at Ranthambhore. Have your breakfast at hotel and then proceed to Kota – Kota has a great historical importance and is famous for its architectural view and natural beauty added by river Chambal. It is also famous for being the industrial city of Rajasthan and producer of sarees. Reach Kota and transfer to the hotel. Start the city tour of Kota with the attractive and interesting sites that includes visit to Jag Mandir, City Fort Palace, Maharao Madho Singh Museum, Havelis of Devtaji which is famous for its paintings and beautiful view and Chambal garden which is a local picnic spot and a relaxing place. Evening is free to explore the local market and night stay at Kota. Morning after hearty breakfast, start your journey to the next city i.e. Chittorgarh. On the way to Chittorgarh stop at Bundi which is at the distance of 38 kms from Kota. Though Bundi is a small place but has got many sites to attract tourists towards it. Visit Taragarh or Star Fort – the most impressive and magnificent building in Bundi, Garh Palace - it holds many buildings of architectural importance in itself and Chhatra Mahal – It has beautiful paintings at walls and ceilings which are worth watching. After sightseeing, continue drive to Chittorgarh. Reach and check into your designated hotel for overnight stay at Chittorgarh. Today after lavish breakfast at hotel, enjoy sightseeing tour of Chittorgarh. The ten must visited sites of Chittorgarh are Tower of Victory, Tower of Fame, Gaumukh Reservoir, Rana Kumbha Palace, Padmini Palace, Meera Temple, Kalika Mata Temple, Fateh Prakash Palace, Jain Temple and the seven gates of the fort. Chittaurgarh and its sites are full of stories related with history of the place and the past which gives the sites a lively touch. Then start drive to Udaipur. Reach and check in at hotel. 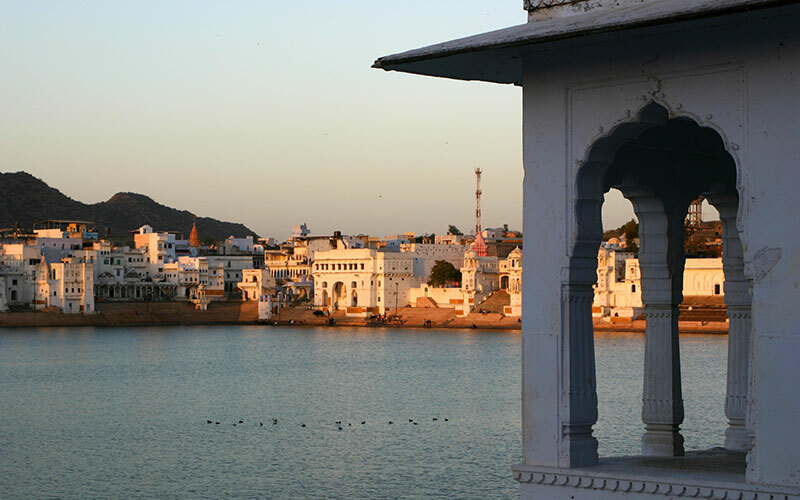 Evening we enjoy the boat ride on a beautiful lake Pichola and reach an island palace – Jag Mandir. Overnight will be at Udaipur. Today after breakfast enjoy the guided sightseeing tour of Udaipur. Udaipur is the city which attracts tourists of all age group and satisfies the thirst of everyone. The lakes of Udaipur offers an adventours and exciting serve to the youngsters and children and at the same time it is most likely by the couples too. Udaipur has got palaces and museum to attract a group of middle age and also old age people. In short it can be quoted that the Udaipur is the city which can easily win the heart of every visitor. Start the city tour of this beautiful city with the City Palace museum, Sahelion-ki-Bari (the gardens of royal ladies lay out with lush green lawns, kiosks, trees and beautiful fountains), Pratap Memorial, Fateh Sagar, Bhartiya Lok Kala Museum and finally Jagdish Temple which is an important site to visit. After this splendid sightseeing you are free for night stay in Udaipur. After breakfast at hotel drive to Kumbalgarh en route visit Ranakpur Jain temples which is situated in the Aravalli range with beautiful carvings and is very important pilgrimage for Jains. Carvings in these temples are so unique and are one in its own type that it can be an example of great versatile architect. Every corner, wall and pillar has got its own unique feature to see and admire. 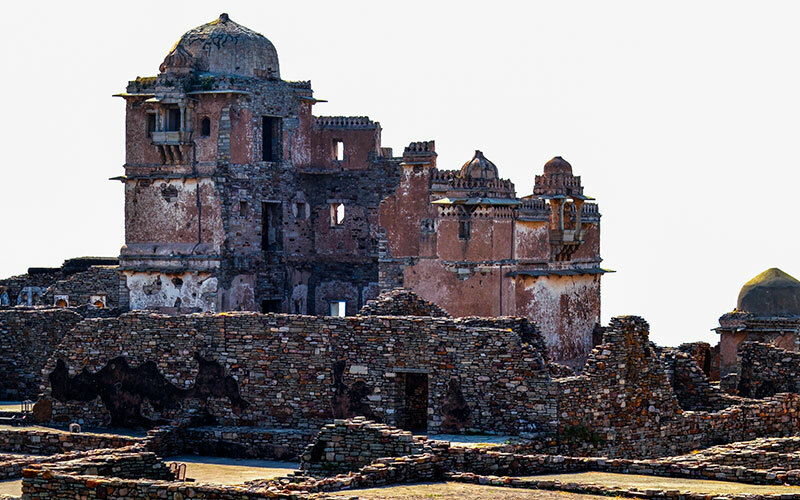 Further drive towards Kumbalgarh, and have a sightseeing of Kumbalgarh fort which is famous because of its defensive and strong built which is the reason that the fort was only once in history taken over by the combined army of Emperor Akbar, Amber and Marwar. Stay overnight at Kumbalgarh. Today after relaxed breakfast drive to Jodhpur. Jodhpur is second largest cities in Rajasthan, founded by Rao Jodha Ji and popularly called as ‘Blue City’. Jodhpur has got many charms to attract visitors. On arrival Jodhpur, get assisted check into your pre-booked hotel. Evening is free for personal activities. Overnight will be stay at Jodhpur. Today after lavish breakfast, enjoy the city tour of Jodhpur that includes Mehrangarh Fort, which is a must to visit place while you are in Jodhpur, Jaswant Thada, Umaid Bhawan Palace-it has got magnetic character to grab the attention of its onlooker and Mandore. Overnight stay will be at Jodhpur. Today after breakfast at hotel proceed to Jaisalmer also known as the "Golden city" in the Great Indian Thar Desert. Jaisalmer has got the reason to be called as golden city as it is covered with the yellow shining sand which has magnet to attract and fascinate the visitor. The culture, color and tradition of true Rajasthan can be closely observed while you are in Jaisalmer. On arrival in Jaisalmer, get assisted check into your designated hotel. Evening is free to explore the beauty of this sandy city. Overnight stay will be at Jaisalmer. Early morning after breakfast enjoy guided sightseeing tour of Jaisalmer. Visit to the fort and haveli of Kaput Nobles and merchants. The most important sites are Patwon-ki-Haveli and Salim Singh-ki-Haveli. Jain temple of Jaisalmer is also an important tourist attraction. In the evening enjoy trip to the most picturesque Sam sand dunes. You can also enjoy camel ride, camp fire and other cultural programs to make your evening a memorable one. Overnight stay will be at Jaisalmer. Morning after breakfast, head to Bikaner – the royal fortified city was established by the younger son of Ranthore Raja of Jodhpur in 15 AD which is lying in the north of the desert state and it was founded after 29 years of Jodhpur. It is also known as the ‘camel city’. On arrival in Bikaner, transfer to the hotel. Evening is free at leisure. Overnight is stay at the respective accommodation in Bikaner. After your breakfast at hotel, enjoy local sightseeing tour of Bikaner. Visit Karni Mata Temple (Rat temple) inhabited by hordes of rats. Also visit Junagarh Fort and museum. Next visit camel breeding farm – one of its kind in Asia. 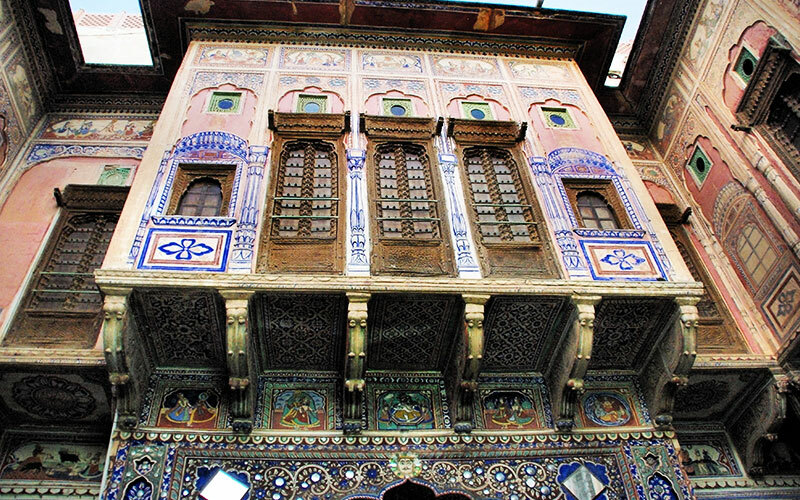 After sightseeing, drive to Mandawa - world famous site for its old havelis and fresco art. On arrival in Mandawa check in at pre booked hotel. Overnight stay will be at Mandawa. Today enjoy sightseeing tour of Mandawa, which is a beautiful city of havelis and famous for its paintings. Visit the Castle Mandawa and colourful havelis of Mandawa. Following sightseeing, we will drive to Delhi. On arrival in Delhi, transfer to the hotel. Overnight is stay at Delhi Hotel. You have a day free to explore the city and finish last minute shopping. After that, a timely transfer will be provided to you by the representative of Max Holidays to the Delhi international airport from where you board your connecting flight back to home. Return back to home with the sweet memories of the India Tour.